Back in December 1981 18 year old Garry Kasparov won the Soviet Championship, tieing for first place with another youngster Lev Psakhis. For Lev it was his second successive Soviet title. Garry lost 2 games at the event, to Psakhis and to Boris Gulko. This was the first high level event that the Soviet authorities had allowed Gulko to play for over a year. He had won the title in 1977 (ahead of a field that included such great players as Tal, Petrosian, Smyslov, Geller and Polugayevsky) and gone on to win the super grandmaster tournament in Niksic in 1978, but Gulko and his wife, Anna Akhsharumova (a WGM), had had their playing opportunities severly curtailed after asking for permission to leave the Soviet Union. They were eventually allowed to emigrate to the United States in 1986. 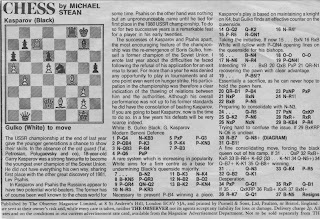 Gulko was to beat Kasparov again a few months later (with Black in just 24 moves) at the USSR Club Teams Championship, and once more at Linares in 1990. He retains a positive record against Kasparov, and is the only man to have won both the USSR and US Chess Championships.